Rogue River, OR (January 11, 2016) – Wagner Meters announces the introduction of two inspection kits for building inspectors and mold remediation specialists: the Building Inspector’s Basic Inspection Kit and the Building Inspector’s Ultimate Inspection Kit. Each kit includes a professional-grade moisture meter and other high-performance moisture detection equipment that inspectors require to quickly and accurately detect the precise location of moisture and water intrusion within a home or building. “We developed these kits to enable building inspectors and mold remediation specialists to have at their fingertips several essential tools for accurately assessing and documenting inspection results for their customers,” says Wagner Sales Manager Ron Smith. “When property owners or potential buyers have to make a major financial decision, such as remediation or buying a home or building, they appreciate inspectors providing them with objective and accurate documentation,” he adds. Wagner Meters designed the BI2200 specifically for building or home inspection, and it comes programmable for a wide range of materials including wood, synthetic stucco, plaster, drywall, insulation materials, ceramic tile, shingles, linoleum, concrete, and more. Designed with a Teflon® pad to protect the sensor area on rough or abrasive surfaces, the BI2200 can provide relative moisture content (MC) readings on building materials without damaging their surfaces. Its Press-and-Hold feature also holds the meter’s readings when inspectors have to work in tight places and don’t have a visual sighting of the meter display. The BI2200 gives inspectors comparative relative moisture content readings for applications that only require relative MC readings. By establishing a known baseline “dry MC” relative reading on building material, the BI2200 can then compare and detect elevated MC problem areas or conditions. The TH-200 Thermo-Hygrometer is a small pocket-sized tool that measures temperature (°F or °C), relative humidity (RH), and dew point temperature of concrete. The Infrared Thermometer is a lightweight, pistol-style thermometer that allows inspectors to rapidly assess the temperature (°F or °C) of a concrete slab. The Building Inspector’s Ultimate Inspection Kit includes everything contained in the Basic Kit plus the Rapid RH® Complete Starter Kit. Depending on how customers plan to use the Rapid RH®, they can choose between either the Rapid RH®4.0 EX Complete Starter Kit or the Rapid RH®5.0 Complete Starter Kit. The Rapid RH®4.0 EX, often referred to as “single-use,” is not actually removed or discarded after taking a sensor reading. Once placed in a hole, the 4.0 EX is always equilibrated and functional and allows moisture conditions to be monitored over an extended period of time. The 4.0 EX Complete Starter Kit includes everything needed to test moisture in concrete, including one Easy Reader with Touch-n-Sense™ Technology and 5 Smart Sensors for RH testing. It also contains several other tools such as a vacuum attachment, wire brush, drill bit, insertion tool, a foam-lined carrying case, and more. The Rapid RH®5.0 is designed for people who prefer “reusable” sensors, operate testing services, and who do a lot of testing each year. The new time-saving feature of the 5.0 saves more time and money than other systems. Each 5.0 comes with its own EasyCare CalCheck® – a protective base integrated with a consistent RH generator. The sensor is stored in an optimal environment, always equilibrated, and always ready for an instant calibration check. In addition, the initial cost of investing in the 5.0 is low enough that it’s possible to have a larger inventory of reusable sensors, removing the need for leapfrogging, that is, those instances where contractors may purchase a small number of sensors to save money, but then leapfrog them on larger jobs. Unfortunately, leapfrogging can take significant additional time, if done properly, or can significantly reduce test accuracy. The 5.0 Complete Starter Kit contains numerous tools and devices, including 5 reusable Smart Sensors, 5 EasyCare CalChecks® at 75% RH, one Easy Reader with Touch-n-Sense™ Technology, one Bluetooth® Smart Reader with Touch-n-Sense™ Technology, a drill bit, insertion tool, wire brush, vacuum attachment, a foam-lined carrying case, and more. 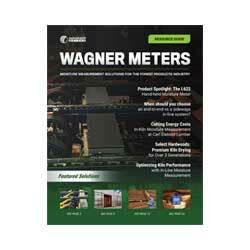 More information on the Building Inspector’s Basic Inspection Kit and the Building Inspector’s Ultimate Inspection Kit can be found at www.wagnermeters.com.